On April 25, 2014, in the framework of the project “Clean Up Georgia – Raising of Public Awareness and Involvement in Solid Waste Management Improvement” (Phase II), Greens movement of Georgia/ Friends of the Earth Georgia held a meeting in Ninotsminda municipality, villageGorelovka. The meeting was attended by representatives of three ethnic groups- Dukhabors, Armenians and eco - migrants from Adjara region. An information package on waste management related issues has been distributed among the participants. The aim of the meeting was to address priority issues with regards of waste management in rural areas. Participants received information about the global waste management practices, as well as waste management practices in Georgia, stressing the problems caused by accumulation of solid waste and planning solutions to this problem Number of participants – 20 local residents. 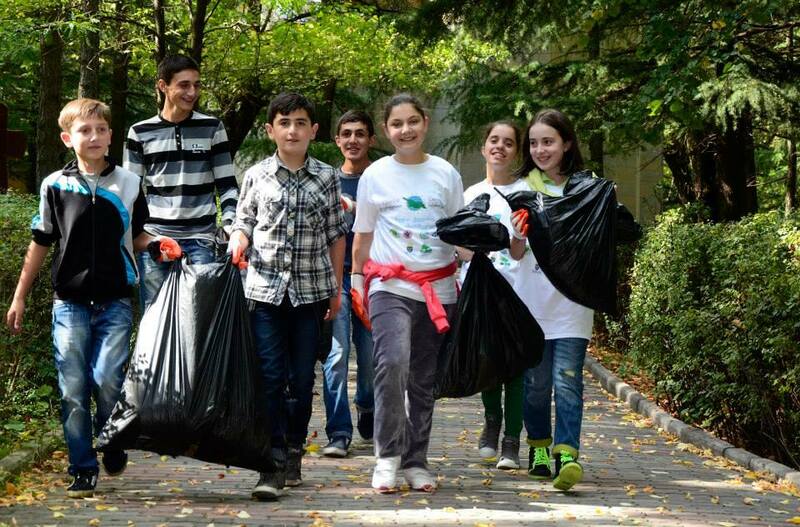 On April 25, 2014, within the framework of the "Clean-up Georgia" campaign and competition “Clean region”, Clean up campaign was carried out in Khobi municipality . Event was organized by the regional coordinator of Greens Movement of Georgia / Friends of the Earth – Georgia and with participation of the representatives of various services of municipality. Mr. Gocha Kajaia - Khobi Gamgebeli (Chief executive of the municipality) also participated in the action. The collected waste has been taken to the landfill by cleaning service of the municipality. On April 22-23, 2014, on the occasion of Earth Day, clean up actions were performed in different municipalities of the region. . The event was organized by the regional coordinator of Greens movement of Georgia/Friends of the Earth – Georgia. 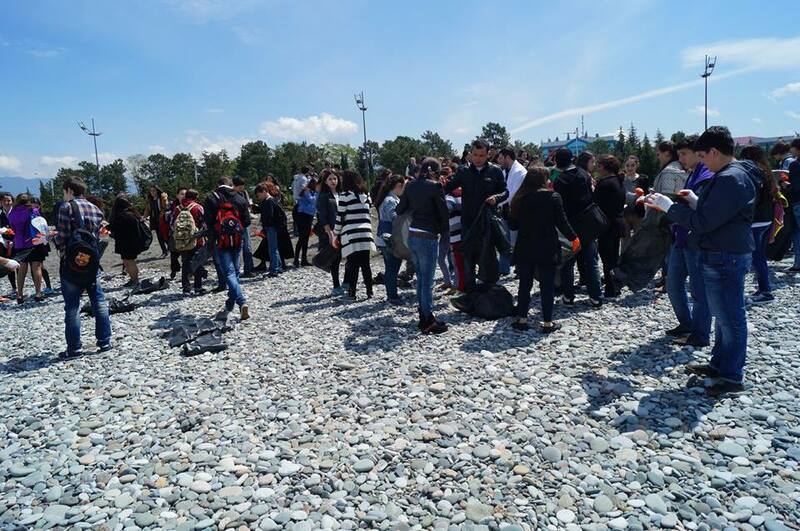 On April 22, 2014, within the framework of the "Clean-up Georgia" campaign and on the occasion of Earth Day, Clean up campaigns were held in Zugdidi, Tsalenjikha, Chkhorotsku and Mestia municipalities. The event has been organized by the regional coordinator of Greens Movement of Georgia / Friends of the Earth – Georgia. On April 22, the Earth Day, within the framework of the project "Clean-up Georgia ", a clean up action was held in Khobi municipality. Event was organized by the regional coordinator of Greens Movement of Georgia / Friends of the Earth – Georgia and with participation of the representatives of various services of municipality. On April 22, 2014, within the framework of the "Clean-up Georgia" campaign and on the occasion of Earth Day, Clean up campaigns were held in Borjomiy municipalities. The event has been organized by the regional coordinator of Greens Movement of Georgia / Friends of the Earth – Georgia. Overall, 100 volunteers took part in the action. Totally, 4 km square meter area has been cleaned up and about 4 tons of waste were collected. 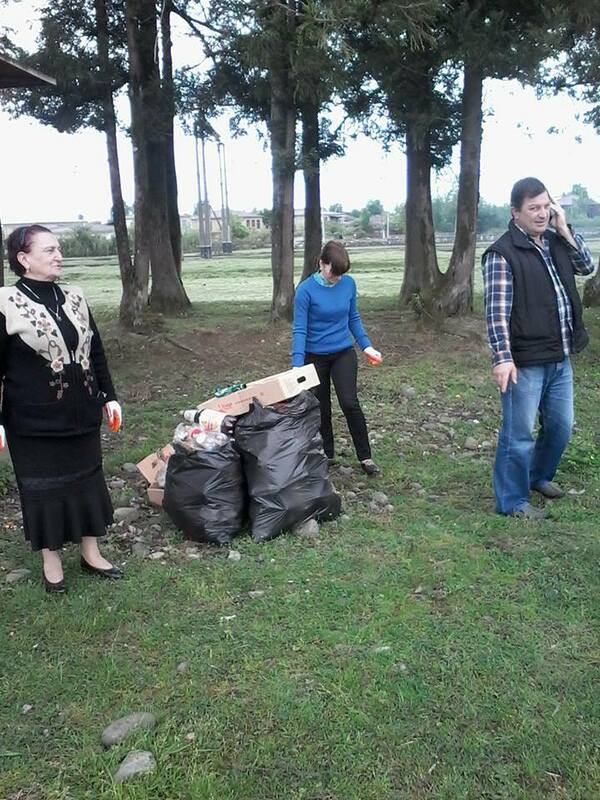 On April 22;23 and 24, 2014, within the framework of the "Clean-up Georgia" campaign and on the occasion of Earth Day, Clean up campaigns were held in Zugdidi, Tsalenjikha, Chkhorotsku and Mestia municipalities. The event has been organized by the regional coordinator of Greens Movement of Georgia / Friends of the Earth – Georgia. On April 17, in the framework of the project «Clean Up Georgia - to increase public awareness and participation in the improvement of solid waste" (Phase II), Greens Movement of Georgia / Friends of the Earth - Georgia organized a meeting with representatives of the villages of Telavi municipality. 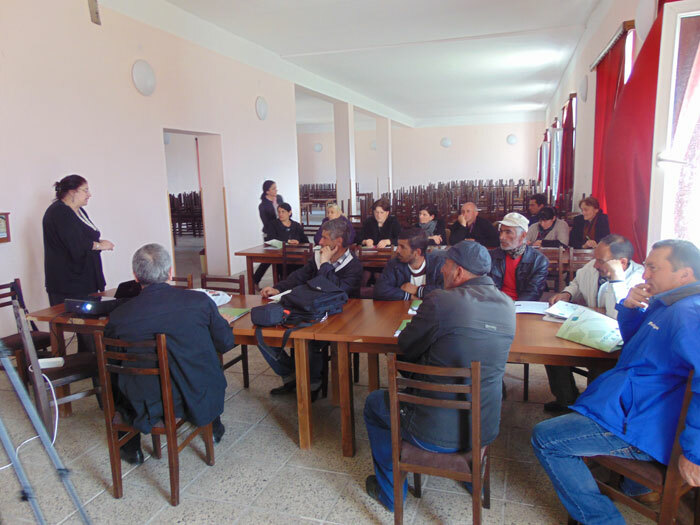 On April 16, 2014, in the framework of the project “Clean Up Georgia – Raising of Public Awareness and Involvement in Solid Waste Management Improvement” (Phase II), Greens movement of Georgia/ Friends of the Earth Georgia held a meeting in Akhmeta municipality, with Deputy District Gamgebeli and municipality employees. An information package on waste management related issues has been distributed among the participants. The aim of the meeting was to address priority issues with regards of waste management in rural areas. Participants received information about the global waste management practices, as well as waste management practices in Georgia. Number of participants - 12 local employees. On April 16, 2014, in the framework of the project “Clean Up Georgia – Raising of Public Awareness and Involvement in Solid Waste Management Improvement” (Phase II), Greens movement of Georgia/ Friends of the Earth Georgia held a meeting in Akhmeta municipality, village Matani, with representatives of local population. 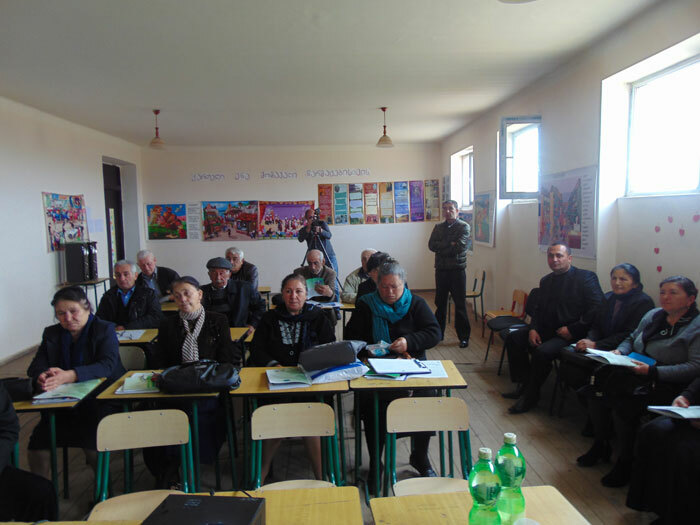 On April 16, 2014, in the framework of the project “Clean Up Georgia – Raising of Public Awareness and Involvement in Solid Waste Management Improvement” (Phase II), Greens movement of Georgia/ Friends of the Earth Georgia held a meeting in Akhmeta municipality, village Kistiauri, with participation of the representatives of local population . An information package on waste management related issues has been distributed among the participants. The aim of the meeting was to address priority issues with regards of waste management in rural areas. Participants received information about the global waste management practices, as well as waste management practices in Georgia. The meeting took place in Raphael Eristavi house museum. Number of participants - 22 local residents. On April 16, in the framework of the project “Clean Up Georgia - to increase public awareness and participation in the improvement of solid waste" (Phase II), Greens Movement of Georgia / Friends of the Earth - Georgia organized a meeting in Akhmeta municipality, village Duisi, with participation of the representatives of local residents. 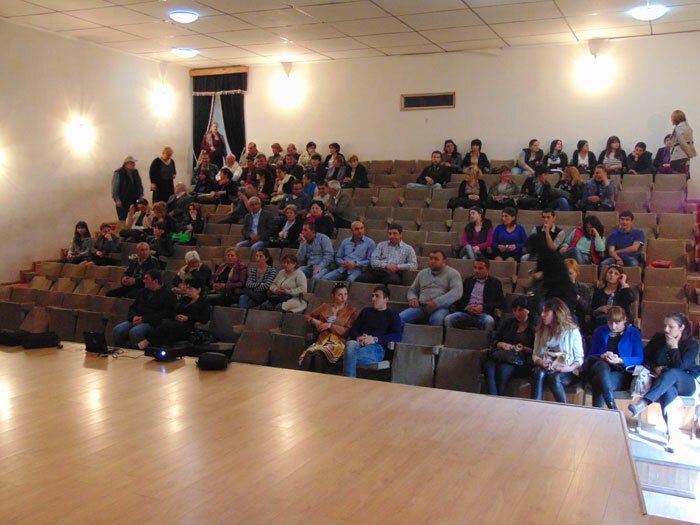 On April 15, 2014, in the framework of the project “Clean Up Georgia – Raising of Public Awareness and Involvement in Solid Waste Management Improvement” (Phase II), Greens Movement of Georgia / Friends of the Earth Georgia held a meeting in Bolnisi municipality, village Rachisubani, with representatives of the local population. An information package on waste management related issues has been distributed among the participants. The aim of the meeting was to address priority issues with regards of waste management in rural areas. Participants received information about the global waste management practices, as well as waste management practices in Georgia. Number of participants - 22 local residents. On April 15, 2014, in the framework of the project “Clean Up Georgia – Raising of Public Awareness and Involvement in Solid Waste Management Improvement” (Phase II), Greens movement of Georgia/ Friends of the Earth Georgia held a meeting in Bolnisi municipality, village Nakhiduri,. with representatives of the local population. An information package on waste management related issues has been distributed among the participants. The aim of the meeting was to address priority issues with regards of waste management in rural areas. Participants received information about the global waste management practices, as well as waste management practices in Georgia. Number of participants - 22 local residents. 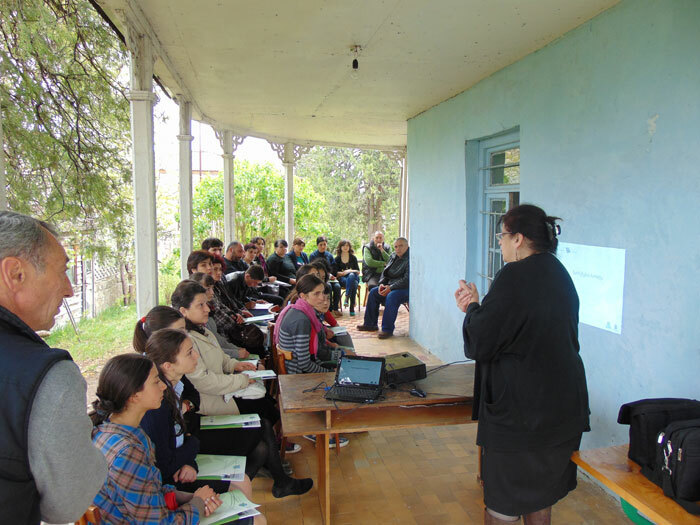 On April 15, 2014, in the framework of the project “Clean Up Georgia – Raising of Public Awareness and Involvement in Solid Waste Management Improvement” (Phase II), Greens movement of Georgia/ Friends of the Earth Georgia held a meeting in Tbilisi public school N 208, with participation of school teachers and pupils. An information package on waste management related issues has been distributed among the participants. Participants received information about the global waste management practices, as well as waste management practices in Georgia. The purpose of the meeting was to address the priority issues in relation to waste disposal problems associated with the accumulation of solid waste in the contaminated areas and planning measures to be taken to solve the named problem. Number of participants - 47 people.